In this file photo, (Back row L-R) Actors Susan Kelechi Watson, Ron Cephas Jones, creator/executive producer Dan Fogelman, executive producers Glenn Ficarra and John Requa and actor Chris Sullivan (front row L-R) actors Sterling K. Brown, Mandy Moore, Milo Ventimiglia, Chrissy Metz and Justin Hartley speak onstage at the 'This Is Us' panel discussion during the NBCUniversal portion of the 2016 Television Critics Association Summer Tour at The Beverly Hilton Hotel on August 2, 2016 in Beverly Hills, California. The "This Is Us" cast came together to spread fake spoilers for season two on fans while shedding light on Red Nose Day. The video was part of NBC's Red Nose Day broadcast, which helped raise over $30 million to help end child poverty. A few of the cast members reveal a fake spoiler from a long-lost brother to one of the characters dating Dennis Rodman in Season 2. The live show was hosted by Chris Hardwick and ended with Bryan Cranston getting dunked in a tank full of freezing water, after the three-part debut of "Red Nose Day Actually," the long-awaited sequel to the 2003 movie "Love Actually." New hits and old favorites are coming back to NBC's fall schedule, with "Will & Grace" making a return to the small screen, as well as "Great News," "This is Us," and "Timeless." 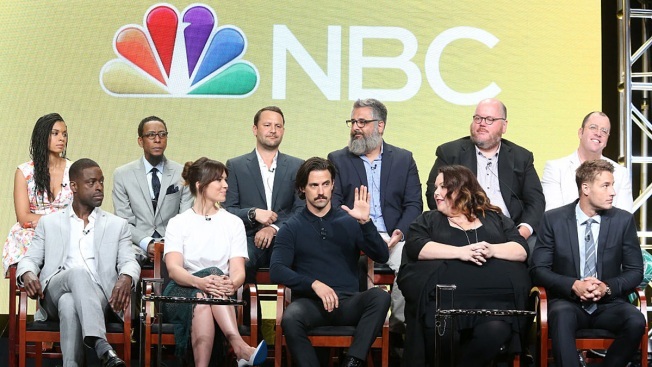 "This Is Us" will air Thursdays this fall on NBC.